Thank you all so much for the requests! I have set aside all the polishes you requested and you expect to see them in the upcoming days/weeks. You can of course continue to make requests. I have come to really love these LA Splash polishes. I didn't know about them until I saw them at Ulta a month or so ago. I really love the glitters. They have wide variety that are unique. These are also a great price $3.99. You can also find them on Cherry Culture too. I got this request to do Golden Seahorse by Steph from In Her Makeup Bag. This is Golden Seahorse layered over black on my index and ring fingers and on its own on my middle finger and pinky. I first thought this was going to be sheer, that's why I had it layered over black. I was wrong this isn't sheer. It goes on opaque with 3 coats, though I do think it looks nice over black too. 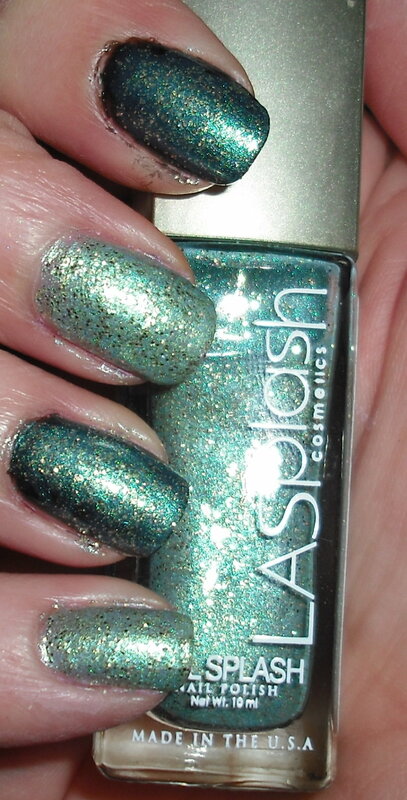 Golden Seahorse is a sea foam green shimmer with gold glitter mixed in. I can say this is a truly unique color. I love the mixture of cool toned green with warm gold glitter. I love that combination with any color. I think it helps to balance out a color so it's more universally flattering. These colors together always make me think of ancient Roman baths and their beautiful glass tile mosaics. They always mixed the colors of sea and added rich golden accents. 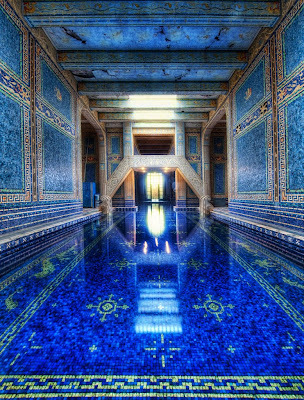 I don't know if any of you are familiar with Hearst Castle. It was built in the 1920's for newspaper mogul William Randolph Hearst in the mountains on the central coast of California. All the rooms/houses had different historical architectural and artistic influences. 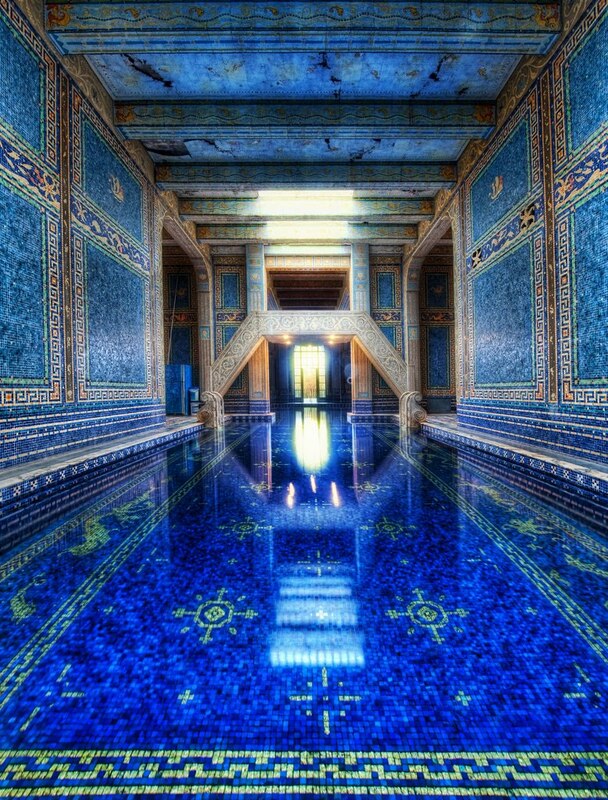 This color reminds me of the indoor pool that was built there that was influenced by the Roman/Greek architecture. I know that isn't the same exactly color of the polish, but it's the idea. Yes, yes, I know I was taking a simple nail polish color way out to left field. I don't know, that's just how my mind works. I like to analyze colors and key into things they remind me of. Plus, this pool is beautiful! Oh yeah, you can visit this place. They do tours every day. My family and I visit a town near by called Cambria and this is just a few miles up the coast from there. We've done quite a few tours here and the entire castle is an amazing spectacle to see. If you have an interest in art, art history, or architecture you might enjoy visiting the website that I've linked in twice in this post. They have a virtual tour and lot of information on the art work/history in the castle! It's worth a look. Ok, I'm done. That was my nail polish/art history/tourism post of the day. Sorry to go on a tangent! I started to nerd out there. That pool looks amazing, it looks like it is almost ethereal! Golden Seahorse looks like it will take some time to remove though. That gold glitter really makes this special. I just can't decide if I like it better over black or on its own. Wow this is unique, I wouldn't think it would be opaque by itself either! Wow, you did this so fast, thank you! I think I need to get myself to Ulta and buy this- it's so pretty! Tara- Thanks! Glad you like this color! jbrobeck- It's so beautiful there! You'd love it. It's in perfect location right on the ocean. Aggie-It wasn't a pain to remove with pure acetone. I don't go any other way with glitters. It's harsher on the nails and cuticles but cuticle oil fixes that up. Freshie- Very unique. I love this shade. Michelle- I think it looks great both ways! That pool room is too much! 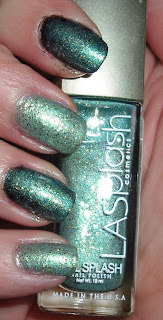 I keep looking at those LA Splash polishes in Ulta. I might try one next time.